P&O’s Cruise Liner, Pacific Dawn, is undergoing an extensive refurbishment, including two new waterslides, further improving the facilities on the ship. 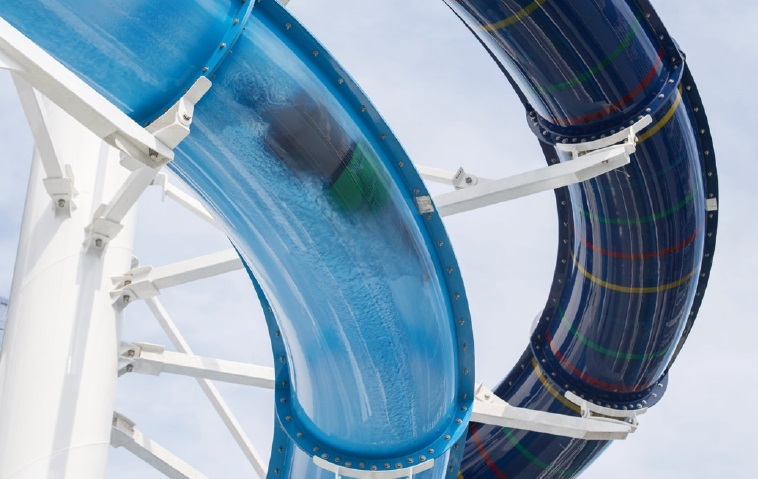 The Southampton-based P&O group, working in partnership with Polin Waterpark’s and Myrtha Pools, installed the two 80m slides to improve their standing in the industry. They are the maiden waterslide additions to the company’s fleet. The 2,020-passenger Pacific Dawn has already built a reputation as one of Australia’s favourite cruise ships. Now the company are hoping the addition of two Aquatube waterslides to the 804-foot vessel, will add a further splash of colour and fun to the guest’s experience. Myrtha Pools, installers of the two 50m pools for the 2016 Rio Olympics, will christen the build in June, with the addition of Polin’s trademarked Magic Shine, Natural Light Effects, Special Pattern Effects and translucent options. Polin’s Aquatubes are a perennial favourite of waterparks around the world, from indoor aquatic facilities to the globe’s largest entertainment providers, including Carnival, MSC and Royal Caribbean Lines, all of whom Polin have worked with before.